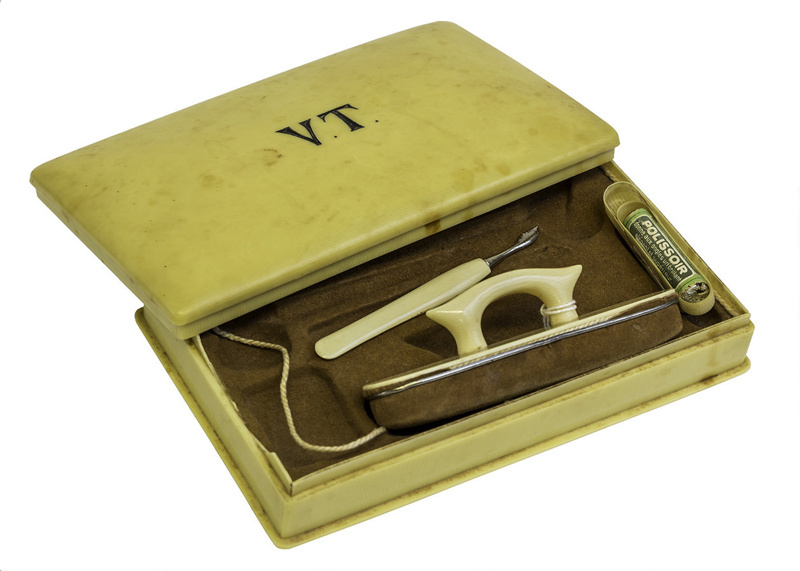 A manicure set in yellow bakelite, which was a precursor to plastic. c 1910-1946 It has a brown chamois lining. It contains items, such as, a buffer, cuticle-knife and 'Polissor' stick. All in good condition, with exception of broken hinges to the lid. Inscription on lid reads, 'V.T', who was Catherine Victoria Thwaites (b 1901 d 1991) also known as Torie, as a young girl, Vic ,as a married woman and Catherine, as an older woman, when residing in a retirement home. She was married to Fredrick James Foote (b 1895 d 1982) in 1936. They lived on Black Swamp Rd, Mangawhai.